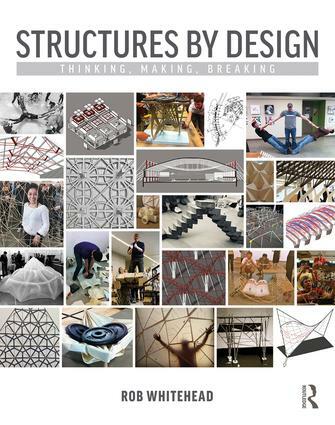 Structures by Design: Thinking, Making, Breaking is a new type of structures textbook for architects who prefer to learn using the hands-on, creative problem-solving techniques typically found in a design studio. Instead of presenting structures as abstract concepts defined by formulas and diagrams, this book uses project-based approach to demonstrate how a range of efficient, effective, and expressive architectural solutions can be generated, tested, and revised. Each section of the book is focused on a particular manner by which structural resistance is provided: Form (Arches and Cables), Section (Beams, Slabs, and Columns), Vectors (Trusses and Space Frames), Surfaces (Shells and Plates), and Frames (Connections and High-Rises). The design exercises featured in each chapter use the Think, Make, Break method of reiterative design to develop and evaluate different structural options. A variety of structural design tools will be used, including the human body, physical models, historical precedents, static diagrams, traditional formulae, and advanced digital analysis. The book can be incorporated into various course curricula and studio exercises because of the flexibility of the format and range of expertise required for these explorations. More than 500 original illustrations and photos provide example solutions and inspiration for further design exploration. Rob Whitehead, AIA, LEED AP is an architect and Associate Professor of Architecture at Iowa State University where he teaches structural design, design-build, and integrated design studios. He was named one of 30 Most Admired Educators by Design Intelligence (2014). He received the Iowa Educator Award (2014) by the Iowa Chapter of the American Institute of Architects (AIA), and the Emerging Faculty Award (2011) by the Building Technology Educators’ Society (BTES). His structural design course was awarded the Association of Collegiate Schools of Architecture (ACSA) Creative Achievement Award. He is the co-author of Design-Tech: Building Technology for Architects (2014) and currently serves as the Wells Concrete Construction Research Fellow.